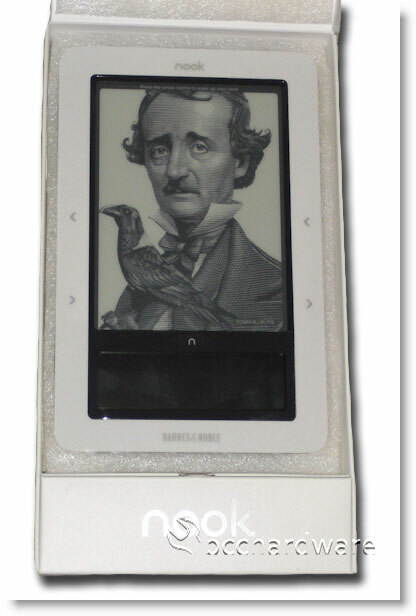 Today we are going to take a look at the Barnes & Noble nook eBook reader. While this won't be a full-fledged review, it will show some of the details, features and benefits that the nook has to offer. For full disclosure, I purchased the nook after I did a fair bit of reading and researched eBook readers. I'm not saying that this is the best, but after you take a look at the article below, you'll certainly see some features that are very handy. One of the most attractive and interesting parts of the Nook is the color LCD touchscreen on the lower part of the device. At this point, the Nook is the only company to offer this feature for navigation. Other eBook readers have e-Ink touchscreens, but no one uses a color LCD for navigation, input and more. They are proud to include this little detail on the box of course. Once you open the box, it appears as if the Nook is powered up, but there is just a screen protector with the visage of a famous painting. One thing that is a nice aesthetic feature of the nook is that it displays a random picture when it is powered off. As e-Ink doesn't use power once the screen is drawn, this adds a nice appearance to the nook and it is certainly more eye-catching than the blank screens of other e-Ink readers.